If you have ever been to San Francisco you know that the weather is about as moody as a teenage girl. In my heart I am a perpetual beach bum, wearing my shorts and flip flops all through winter, however, I have to put that on hold from time to time when the temps dip below 50 degrees. In order to maintain my casual beach vibe I love a good beach pant. SO I head to my favorite online store Swell to check out their selection. Mmmm Yes, thank you please. 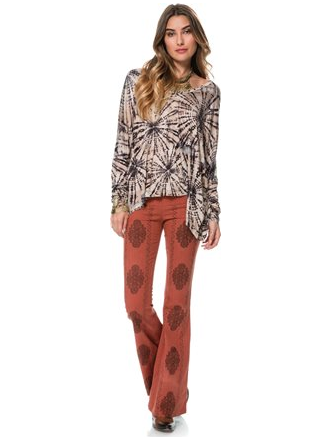 These pants are called RVCA Knockie Embroidered Pant the price is $56. At my price point its a little too much but if they were to go on sale I don’t think I could stop myself from scooping them up! Tan booties, leather jacket, RVCA rider pant = good to go. These pants are totally out of my normal realm of pant buying, snake skin is something that has not entered my closet but I would love to change that with these beautiful pantaloons and they are on SALE right now! These, Roxy Slightest Sound Cargo Pant – come in both black and green. Both colors are in my cart at the moment. These would be cute dressed up or down. Gladiator sandals, hi-top converse. Leather/denim jacket. I really see endless possibilities with these babies and I imagine them to be so soft and silky. I hope my selection of beach pants gets you dreaming of your own. Half the fun of shopping is dreaming of where you can wear your new digs! 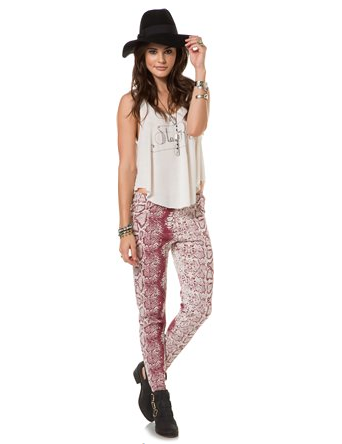 Get dreamin’ and dancin’ in your new beach pants!